I don't know what took so long to finally have a Cyborg solo comic book series, but I'm glad it's finally here. The full-fledged Justice Leaguer has emerged as a vital member of the DC universe. From growing up as a Titan to a powerful hero on his own, the popular Cyborg is finally getting the attention he deserves. Always a popular animated character from Teen Titans and Justice League animated features, Cyborg #1 by David Walker, Ivan Reis, and Joe Prado have ushered in a new era for the cybernetic warrior. With an expected cameo in upcoming Batman V Superman: Dawn of Justice, as well as a role in the live-action Justice League movies and a solo film to come, Cyborg is getting a fresh reboot just in time to remind everyone who Vic Stone is. The new series begins with a battle on another planet between Technosapiens and Tekbreakers. It's a vicious confrontation, an unyielding firefight of energy and light. It serves as a bookend to the main story. Vic Stone's narration comes in the form of a clean, well-designed red-bordered narration box by letterer Rob Leigh. Walker provides a lot of backstory while also keeping readers up to speed on the present (See 8-page preview for more context). It's a dense narrative that introduces Vic's father, Silas and his colleagues. The main and always heart-wrenching aspect of his life is the chilly relationship with his father. Oftentimes seen more as an experiment than a son, Vic tries to reconcile those feelings and finds a sympathetic friend in one associate, Sarah Charles. The art in Cyborg is an ambitious and gorgeous tapestry of intricate lines by Reis and inks by Prado. While Adriano Lucas enlivens the panels with electric colors in a multitude of hues. The layouts challenge the reader with creative and efficient montages that provide concise exposition. It really is a team effort as each artist collectively builds Vic's world with painstaking detail and energy. From the designs of the Teksapiens and Technosapiens to the interiors of STAR Labs, Cyborg #1 is a visual feast for the eyes. Cyborg #1 is off to a promising start anchored by Walker delving into the emotional heart of Vic while also setting up the impending threat of the Technosapiens. Cyborg has always been a compelling figure and Walker understands that. 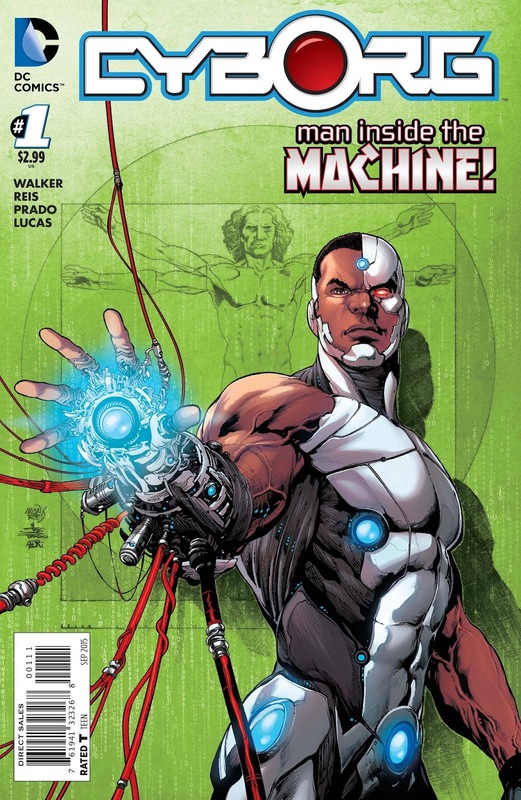 The new series is singularly about Cyborg, not in relation to the League or the Titans, but about who he is post-New 52. It's criminal we haven't had an ongoing for Cyborg until now but to DC's credit, this series is the one fans have been waiting for.